This is the Puzzle Question which will make you think out of box. In the given Puzzle Picture, you are given a task to make an Odd number even by removing one alphabet. To some people, this may look illogical but if you can you think out of box, this puzzle question can be solve very easily. Let's see if you can solve this Out of Box thinking question? 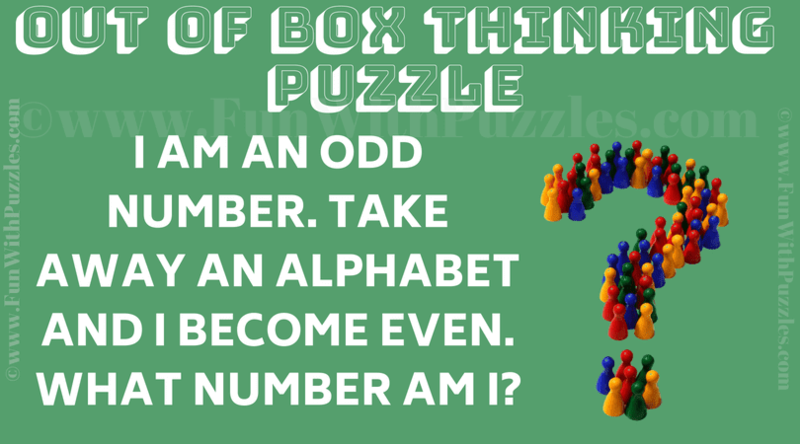 Can you solve this out of box thinking question? Answer of this "Thinking Out of the Box Question", can be viewed by clicking on answer button. Please do give your best try before looking at the answer. Seven. Take away letter s to make it even. your answer to this out of box thinking question is right.